After establishing her own business success, Ndinagwe teaches other business women in Tanzania vital skills in savings and entrepreneurship to grow their businesses. This is the first story in our month-long #SheFightsPoverty blog series in honor of International Women’s Day 2017. Ndinagwe Mboya (left), a TechnoServe business counselor, shows entrepreneur Vicky Katage how to use a mobile savings platform to plan for business growth. When Ndinagwe Mboya decided to build her business skills, the 22-year-old never imagined herself standing in front of a room full of women, teaching them about profit and loss as a business counselor for the Business Women Connect program. Yet in late 2015, Ndinagwe joined a TechnoServe business training with other young women and men and spent three months building interpersonal and business management skills through the STRYDE curriculum. “I learned how to believe in myself and my ability to succeed,” she says. Now in its sixth year, STRYDE strives to set rural youth in East Africa on a path of economic independence. Starting with self awareness exercises and personal effectiveness training – including skills such as communication and decision-making – STRYDE helps young people discover their strengths, present themselves professionally, manage their finances and start their own enterprises. One of the businesses Ndinagwe started after graduating from STRYDE was an egg incubation service. “What woke me up in STRYDE training was personal effectiveness. This made me discover the opportunity I had that I could use to start and grow business,” she says. Ndinagwe decided to start with what she knew by reviving her ailing father’s egg incubation business. She borrowed some money from her friend to buy two trays of eggs, and was able to repay the loan 45 days later after tripling her returns. 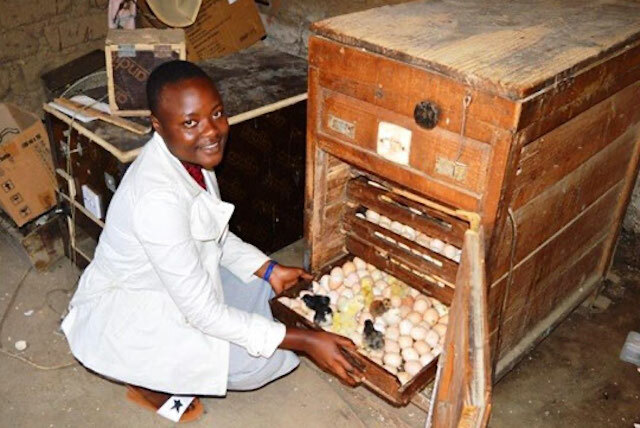 Gaining more confidence from this early success, she wrote a business plan for STRYDE’s competition and used the prize money to buy her own chickens to lay eggs. Yet her dad, who was left paralyzed by a stroke in 2012, advised her not put all her eggs in one proverbial basket. So Ndinagwe diversified her farming business by buying two young pigs to breed as well as rabbits. Ndinagwe went from not earning any income, to earning more than $210 a month. She uses income from the incubation business to help with family expenses, and she is saving up other earnings to expand her business, build her own house and continue her education. “I want to go back to college and get further educated in entrepreneurship and business management. My dad cannot pay for my education so I will save and pay for myself from my business,” she says in a determined voice. Ndinagwe visits handicraft entrepreneur Martha Bukuku to review her business record-keeping. 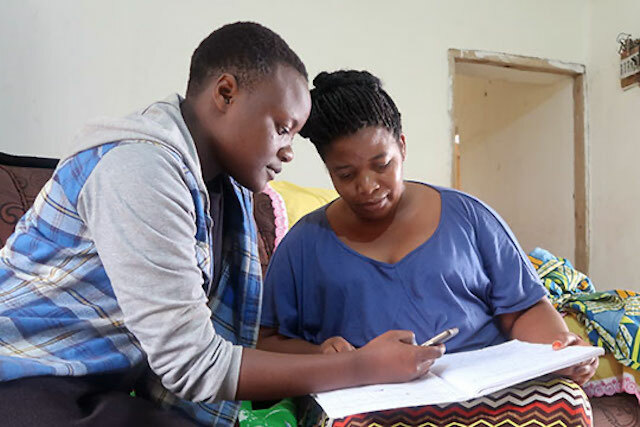 Ndinagwe’s STRYDE trainers took note of her rapidly growing confidence and business acumen, and urged her to apply to become a business counselor for a new TechnoServe program, Business Women Connect (BWC). After two interviews, she got the job and with it, the opportunity to help other women achieve their business dreams. 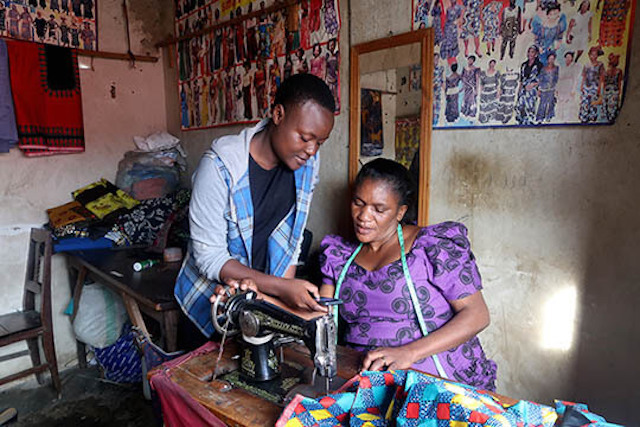 Funded by the ExxonMobil Foundation, Business Women Connect aims to improve women micro-entrepreneurs’ access to mobile savings technologies and business skills in two regions in Tanzania. Ndinagwe and 14 other local women business counselors learned facilitation skills in a three-week training, where Ndinagwe paid special attention to practicing her public speaking skills. “When I started training women I was not afraid. My voice had increased and I felt well-equipped to do the work,” she says. 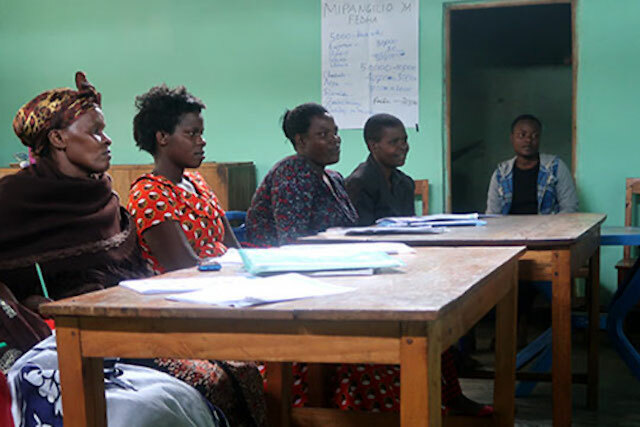 Ndinagwe meets with small groups of women once a week for 12 weeks to deliver training using activity-based learning and video. Together, they develop skills such as setting business goals, mobilizing finance and record-keeping. The women also receive training on gender equality and on the use and benefits of M-Pawa, a mobile savings platform from Vodacom. Ndinagwe (far right) screens a training video for one of her BWC groups in Mbeya, Tanzania. Ndinagwe follows up with individual women to advise them on their business and ensure they are putting these lessons into action. She notes that the trainings on record-keeping and profitability are particularly helpful, as many of the women had never separated their business finaces from their personal and family finances before. BWC participants are gaining a network of other women entrepreneurs in their community, and Ndinagwe has become a role model to many of them. Thanks to the training, Martha realized she could expand her business by using savings, without taking out a loan. After talking with other businesswomen and asking customers about their preferences for the first time, Martha was able to identify a new product line for her business – handmade jewelry purses, which are already selling well. The changes Vicky and Martha have made since receiving training from Ndinagwe can help grow their businesses and benefit the women and their families for years to come. In order test the program’s assumptions, and potentially scale it to other regions and countries, BWC was designed to include a rigorous evaluation. The Center for Global Development (CGD), in collaboration with the World Bank’s Africa Gender Innovation Lab (GIL), is running a randomized control trial with two treatment groups and one control group. The evaluation will help BWC determine the impact of promoting access to mobile savings among women micro-entrepreneurs, and to test whether these impact vary when supplemented with training on business skills.